Neil Bohr, a danish physicist, proposed the Bohr atomic model in 1913. Bohr modified the problems and limitations associated with Rutherford’s model of an atom. Neil Bohr made postulates using Planck’s quantum theory. 1. The atom has a massively positively charged nucleus. 3. Only those orbits (or energy level) are possible for which the orbital angular momentum of the electron is equal to an integral multiple of (h/2π) i.e. Such orbits are also called as stationary or stable orbits. The energy levels are represented by an integer (n=1,2,3…) known as the quantum number. This range of quantum number starts from nucleus side with n=1 having the lowest energy level. The orbits n=1,2,3,4… are assigned as K,L,M,N… shells and when an electron attains the lowest energy state it is said to be in the ground state. 4. The electron does not radiate out electromagnetic energy while revolving in these stationary or stable orbits. 5. The change in energy occurs when the electrons jump from one orbit to other. When an electron jumps from an higher orbit to a lower orbit it releases energy in the form of radiations and when an electron jumps from lower orbit to a higher orbit it absorbs energy in the form of radiations. 1st orbit (energy level) is represented as K shell. 2nd orbit (energy level) is represented as L shell. 3rd orbit (energy level) is represented as M shell. 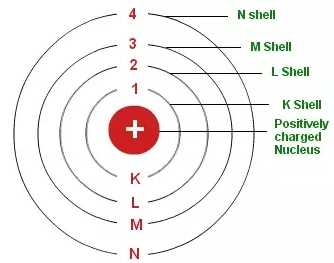 4th orbit (energy level) is represented as N Shell. The orbits continue to increase in a similar manner. where, ‘n’ denotes the orbit number. 1. It failed to explain the Zeeman Effect (effect of magnetic field on the spectra of atoms). 2. It also failed to explain the Stark effect (effect of electric field on the spectra of atoms). 3. It violates the Heisenberg Uncertainty Principle. 4. It could not explain the spectra obtained from larger atoms. Q. What are the modifications made by Bohr in Rutherford’s model of an atom? Answer. According to the Rutherford’s model of an atom, a nucleus (positively charged) is surrounded by negatively charged electrons. Bohr modified this atomic model by explaining that electrons move in fixed orbital’s (shells) and not anywhere in between these orbits. Bohr also explained that each orbit (shell) has a fixed energy level. Bohr found that an electron located away from the nucleus has more energy, and electrons close to the nucleus have less energy. Rutherford basically explained nucleus of an atom and Bohr modified atomic model into electrons and their energy levels.